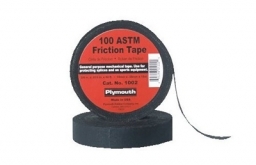 Description: 15 mil thick general purpose tape that provides excellent protection against abrasion. A high quality cotton fabric coated on both sides with a black rubber adhesive compound which provides good adhesion to all types of surfaces. 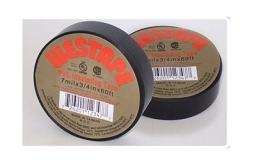 Description: 7 mil UL listed vinyl electrical tape, matte finish, low lead. Used for joining and splicing wires and cables for electrical insulation. Description: 7 mil thick polyvinyl chloride (PVC) color coding tape. 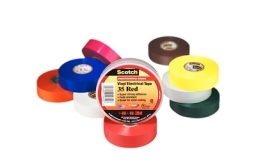 Outstanding electrical and mechanical properties make this tape excellent for use in phase identification, color coding of motor leads and piping systems, and for marking safety areas. The tape operates over a wide range of temperatures - up to 221°F (105°C); it applies smoothly and conforms well above 32°F (0°C). This tape is available in nine fade resistant colors. 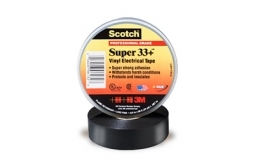 Description: 7 mil thick, all-weather vinyl-insulating tape. It is designed to perform continuously in ambient temperatures up to 105°C (220°F). The tape is conformable for cold weather application down to -18°C (0°F). It has excellent resistance to abrasion, moisture, alkalies, acids, corrosion and varying weather conditions (including ultraviolet exposure). The combination of elastic backing and aggressive adhesive provides moisture-tight electrical and mechanical protection with minimum bulk.